Also called trigger point myotherapy, this technique consists of alternating levels of concentrated pressure on areas of muscle spasm. The therapist applies pressure with fingers, knuckles, or elbows, with pressure remaining constant for ten to thirty seconds. This form of massage therapy is generally the most effective type for low back pain, and is recognized by the American Academy of Pain Management as an effective treatment for back pain caused by soft tissue injury (such as muscle strain). Neuromuscular Therapy examines six physiological factors that may create or intensify pain patterns. Myofascial release refers to the manual massage technique for stretching the fascia and releasing bonds between fascia and integument, muscles, and bones, with the goal of eliminating pain, increasing range of motion and balancing the body. The fascia is manipulated, directly or indirectly, allowing the connective tissue fibers to reorganize themselves into a more flexible, functional fashion. Fascia is located between the skin and the underlying structure of muscle and bone, it is a seamless web of connective tissue that covers and connects the muscles, organs, and skeletal structures in our body. Muscle and fascia are united forming the myofascia system. 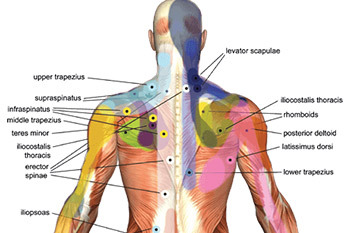 Trigger points are tiny knots that develop in a muscle when it is Injured or overworked. These points are defined as localized areas in which the muscle and connective tissue are highly sensitive to pain when compressed. Pressure on these points can send referred pain to other specific parts of the body and are a common cause of most joint pain. They are also known to cause headaches, neck and jaw pain, low back pain, tennis elbow, and carpal tunnel syndrome. Sports massage can be very helpful for professional athletes as well as the weekend warrior. It is a great way to increase flexibility, keep muscles loose, reduce injuries and improve recovery time. Some sports injuries commonly seen are: Iliotibial Band (Itb) Syndrome, Runners Knee, Jumpers Knee, Piriformis Syndrome, Achilles Tendonitis, Plantar Faciitis, Hamstring Pull, Patella Tendonitis and more. Massage can be helpful in reducing discomfort while aiding in the healing process, in addition to lessening the incidence of these occurrences. How and why the MyoKinesthetic System Work? If we have a fall, pull a muscle, or lift something incorrectly, something interesting happens to our body. As a muscle on one side of our body tightens or shortens, the brain relays a message to a muscle on the opposite side of our body to lengthen in an effort to compensate. Don’t let an injury cripple you. Kinesiology Tape can help prevent injuries and offers stability and support for existing physical limitations. An expert application of the KT Tape can help prevent knee pain, shin splints, heel pain and more. As the material gently bonds to your skin, it provides an ultra light, strong and flexible means of support. The proper application of Kinesio Taping has been known to bring immense relief to those with sore muscles and stiff joints, without having to be constrained or limited by bulky supportive wraps and braces. The term PEMF means "Pulsed Electromagnetic Fields“ and describes in modern medicine the specific application of unique pulsed, electromagnetic frequencies and intensities for the health benefit of human beings and animals. Research has shown that low energy pulsating fields within the frequency range of “the biological window” (3-25 Hz), as well as the inner and outer wave patterns of the Earth’s magnetic field (7.83-11.79 Hz) can produce remarkable positive changes within the body.